Quality Importers 50 cigar cedar box humidor with Hygrometer – this is a great small desktop humidor with a Mahogany finish. It’s one of the most popular humidors with hundreds of reviews. The lining is Spanish cedar. The hardware is gold plated and looks first class. A very nice cheap humidor. 2. 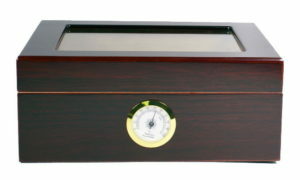 Case Elegance Cherry Finish Cedar 25 Cigar Humidor – hygrometer and humidifier are included. Cedar is the absolute best material for a cigar humidor. 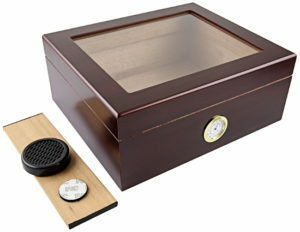 This humidor is magnetically sealed and passes the dollar bill test. This seal will keep your cigars nice and fresh. 3. 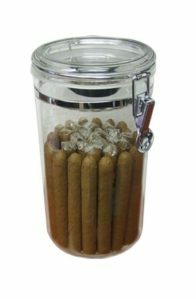 Prestige Import Group Acrylic Humidor Jar – this is super cheap (under $20) humidor but at the same time will still keep your cigars fresh. The bottom lining is Spanish cedar. The top securely clasps down for a super tight seal. A humidifier attaches to the bottom of the jar lid. 4. 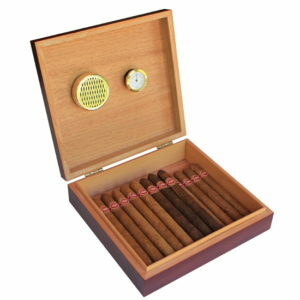 Scorch Torch 70 Cigar Humidor – this humidor is adjustable from 18 cigars to as many as 70 cigars. It’s wooden with a glass top with hygrometer and humidifier. The finish is cherry and looks really nice. 5. Mahogany 50 Cigar Humidor by Kendall – this classy desktop humidor is lined with the aromatic Spanish cedar which will preserve your cigars forever. It comes complete with hygrometer and humidifier. The hardware is solid brass…very nice touch. 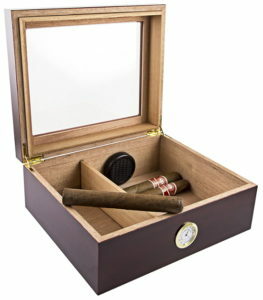 This cheap humidor also comes with a cigar cutter and an eye dropper. This entry was posted in Humidors by admin. Bookmark the permalink.